Hi Mathieu, we are preparing the site for the concept phase and will enable it no later than Thursday (the19th). I will send an email to all participants to announce this. HI Cliff, yes this material is not well suited to a kitchen application. Not only because of the treated wood but also as a composite there would be resins. Thanks Barbara, Felix. I was thinking along the lines of Epicurean products which are dense, hard composites, yet I’m sure they use clean wood sources for their kitchen cutting boards and the like. Raquel, I’m glad to see you are participating in the BioBuild challenge because your project sounds like a perfect fit! Hi Joe, that is a conundrum, however you could submit two concepts…The theoretical is perhaps more likely to win prize money but the practical may garner an licensing agreement with FPInnovations to bring the idea to commercialization. Japanese architect Shigeru Ban used prefabricated wall panels for his ‘Furniture House’. The panels simultaneously provide structure, storage, hvac systems as well as space definition. Below is a link to some more images. 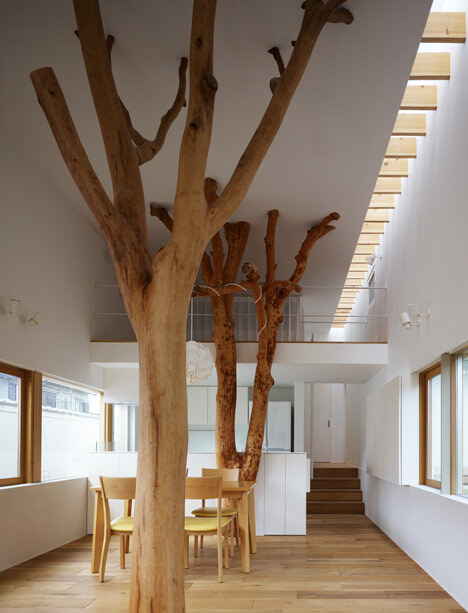 Japanese architect Hironaka Ogawa used two trees in their natural form as beams in a house where the two trees once stood. The trees were cut down carefully to leave the branches intact and then they were dried over a two week period. Now that is re-imagining wood post and beam construction. Two design students in Finland have explored working with the swelling and movement of wood to add structure and a predictably unpredictable aesthetic. Here is a link that explains their project. Two of constituents of wood lignin and hemicellulose, become an adhesive when heated up. This means that vibration can be used to ‘weld’ two pieces of wood together without adding an adhesive. This technology is quite new but has some great potential. Check out this post for more information. Nothing in particular comes to mind, but this feature of wood could be used in situations where a machine has a lot of vibration and the mounts could be made of several layers of wood. When the mount fails, the vibration of the machine would cause the mounts to self-heal. Yes like a smart material that re-asambles it self, sounds excelent! That lighting product hits all the touchpoints of a good product…not surprising it was a hit on kickstarter. The 360˚ articulation of the plywood spine kind of boggles my mind, I can imagine some flex but that is incredible! Welcome to the group and thanks for sharing your Pinboard on wood. Is your exploration with joinery for furniture or building systems? Interesting idea Wong. Might have been an option for Tomas Rojcik\’s student project he shared in an earlier post. He had prototyped salt and pepper shakers that involved a \’split\’ edge of wood created with an axe. In addition to cutting boards the Germans are using wood (particularly pine heartwood) for hospital furniture, and wood-based fabrics for bath mats and mattress covers for the same antimicrobial effect. The hydroscopic nature of wood and burnt wood may have some negative attributes but together they are essential for whiskey barrels.